New Delhi, 4th July, 2013: Inheriting the distinctive design and features that are fast-becoming LG signatures, LG Electronics, a worldwide technology, and design leader in mobile communications today introduced the newest edition to its Optimus family- Optimus G Pro. With 1.7 GHz Qualcomm Snapdragon 600 quad-core processor and 5.5 inch full HD display that gives life like quality, Optimus G Pro smartphone is a power-house. It boosts advanced UX features developed specifically for the device, Dual Recording and Virtual Reality (VR) Panorama and its full HD quality is that of LG’s high definition TVs. The smartphone offers Dual Recording feature that captures video with both the front and rear cameras simultaneously for a unique picture-in-picture experience. The VR Panorama feature allows 360 degree viewing, from taking pictures of both horizontal and vertical environment. The smartphone has the largest battery capacity with 3, 140 mAh, allowing for full HD viewing enjoyment with an improved 13 MP rear and 2.1 MP front Full HD camera. LG’s first Full HD smartphone adopts a Full HD IPS Display which doubles the resolution compared to True HD IPS. The smartphone features 5.5 inch display with a 1, 920 X 1, 080 resolution and has a total of 2, 073, 600 pixels. This model has a pixel density of 400ppi which is the highest amongst the smartphones in the market. This enables text and images to look much more vivid, crisp, and brighter. LG’s Full HD IPS uses the backlight of its panel to increase brightness thereby, not affecting the battery lifespan. 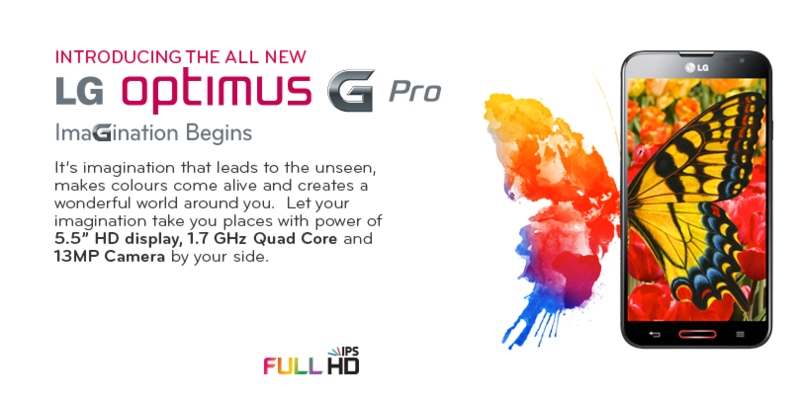 The Optimus G pro is the first smartphone to be equipped with 1.7 GHz Qualcomm Snapdragon 600 quad-core processor. The new processor improves the performance by 24 percent. The front facing camera has a resolution of 2.1 MP with a removable battery of 3, 140 mAh- the highest capacity in the class. LG’s 5.5 inch display fits to the hand due to the narrowed width and minimized bezel to 3.65mm. The straighter sides of the phone offers a solid place to grip onto the phone, resulting in a better one-hand grip for easier use. The smart LED lighting around the home button displays various colors to alert users. The lighting alerts the users for missed calls and messages among other notifications with various colors. The edges finished with sleek metal offers a dynamic image. The front with a slightly curved 2.5D glass adds depth. The digital cube pattern in the back creates a sleek texture which sparkles depending on the angle at which the light hits it. The Optimus G Pro comes with advanced user experience specifically for the device such as Dual Recording, Dual camera and Virtual Reality (VR) Panorama. Dual Recording allows users to capture video with both the front and rear cameras simultaneously for a unique picture-in-picture quality experience. The VR Panorama allows shots of entire horizontal and vertical environments for a full 360 degree view. The Pause and Resume Recording allows stopping and starting in the record mode, for one continuous video file. The Tracking Focus enables the camera to focus on a moving subject while recording a high-definition video. The WDR recording perfectly balances contrast between light and shade while recording a video. Creative and innovative UX features popular with Optimus G users have been added to the Optimus G pro, such as upgraded Q Slide, Live Zooming and Quick Memo. Other features in the smartphone are Q Remote, Smart Video, Audio Zoom, Video Wiz, Magic Remote Pad and Text Keypad, Rainbow colour LED and Colour Emoticons.